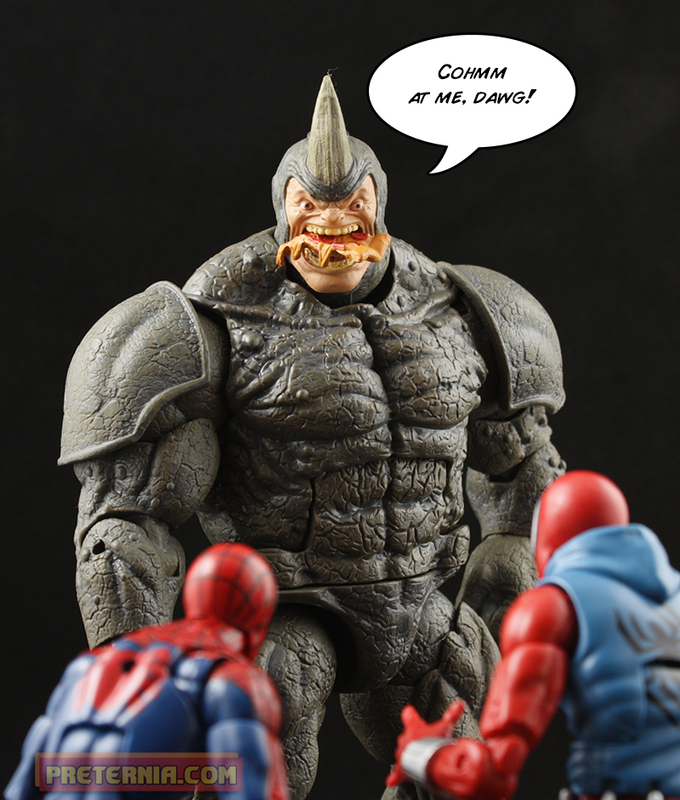 As we’re closing out our Marvel Legends releases for the year Hasbro hit us with one final Spider-Man wave with a build-a-figure of the iconic villain Rhino. Most of the retail waves this year have been heavily movie influenced with Avengers: Age of Ultron, Ant-Man, and Fantastic Four (lol) in the theaters. The Spider-Man line, on the other hand, has been a comic fan’s dream come true. There have been so many Spider-Man variants, allies, rogues, and extended universe characters seeing plastic and it’s pretty amazing. It looks as though Rhino will be my last Marvel Legends build-a-figure for the year barring that magical Red Skull Onslaught hitting shelves early. 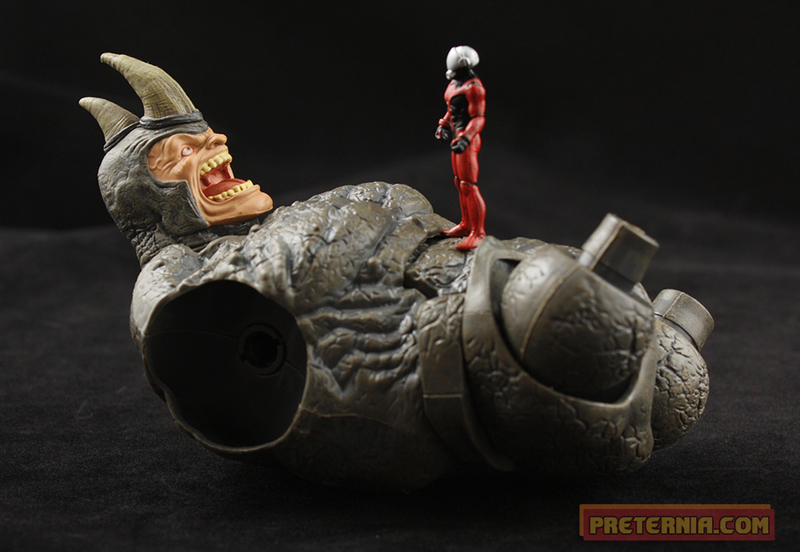 I think he’s a nice mix in size between the recently released Hulkbuster and Ultron. He’s thankfully also not that giant machine thing from the last Amazing Spider-Man movie. Not that I think giant robot Rhinos aren’t cool, they are, but comic Rhino is where it’s at. I also haven’t seen either of the new Amazing Spider-Man movies, so all I have to go on is screen shots from the internet. I’ve heard they were a bit of a disaster. In order to complete Rhino you will need one of every figure from the wave except for Misty Knight or White Panther. Both of the females in the wave come with a Rhino torso, so if you aren’t married to getting every figure you can save a few bucks. 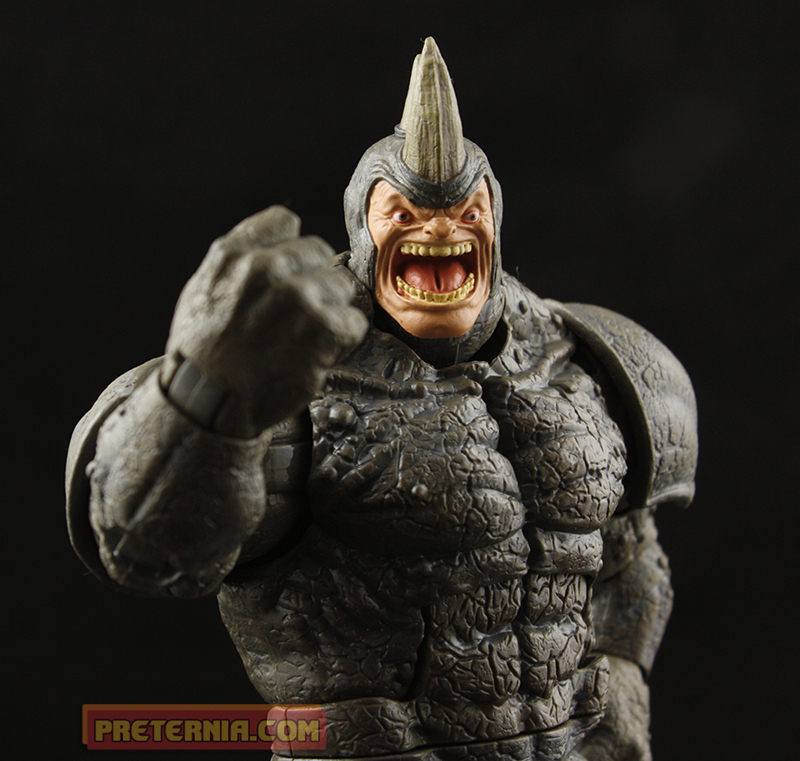 Rhino also comes with two heads, a modern and more traditional sculpt that are both packed with Scarlet Spidey. I believe the heads can be swapped, and I have been doing so the past couple days. However, the peg used is a bit suspect because it is similar to the one used on the arms that lock in once placed in the socket. You may just want to be cautious and not push the head in too hard if you plan to swap it out the later. If you are dead set on one head, then go nuts! It appears as though the days of non-painted plastic are mostly behind us. Rhino has a beautiful wash, and all of his paint applications are clean and appropriate which show off his fantastic sculpt. He does have wonky eyes on his crazy face. It’s possible this was intentional. Either way, it’s kind of fitting to the character so I give it a pass. Since I do have an extra Rhino body it is kind of fun to put his crazy face on the limbless one. I wouldn’t mind making a second Rhino, but besides Chameleon I really don’t need doubles of anyone else in this wave. If you can find the Rhino wave in stores it will cost you about $120 at minimum to complete the figure. I personally haven’t seen the figure anywhere but online stores like Amazon as of yet. I’ve heard of Target and Walgreens getting them in, however. If you want to try your luck there. All in all Rhino is a very strong build-a-figure in a year where the build-a-figures were really well done. The only stinker to me was the Allfather. Rhino is probably my second favorite after Hulkbuster. He’s well done, appropriate to the wave, and just all around fun. 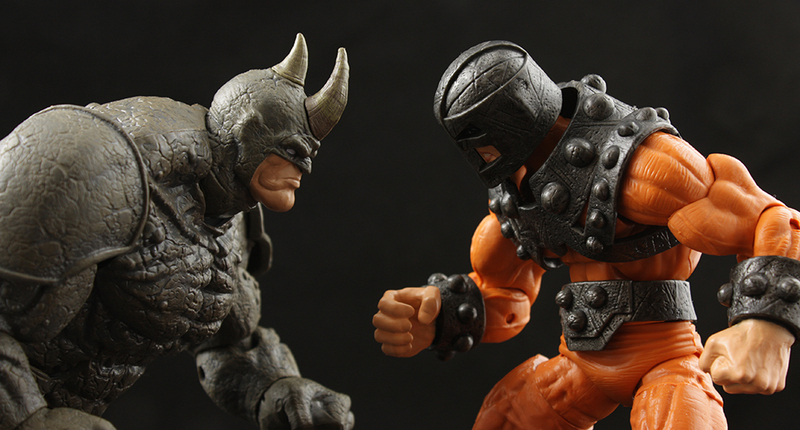 Also I didn’t feel like any of the figures I had to buy to make Rhino were only purchased for the BAF part. In post I noticed that Rhino really attracts to dust. I sincerely apologize for all the shots of dust hanging off of his horn! Case in point the next picture, damn Rhino horn. I am very tempted to order this whole wave. I’m not even a big fan of Rhino’s, I just like all the figures (although I could do without White Tiger, I don’t really like that body too much). Also, don’t bother with either Amazing Spider-man movies. I wanted to walk out of the first one, only staying because I went with a friend, and the second was just as bad, except actually worse. I liked the first movie, but I never saw the second — it looked a little too “Batman and Robin” meets “Spider-Man 3”. I really like the Ghost Rider from this wave — so who knows, I may end up picking up at least some of the others.